There are solo magicians today who are making over $20,000 per performance, while those in the big leagues routinely bring in over $20 million a year. How did they get there and what are the keys to their success? What skills and techniques do they possess and deploy that can be easily adapted for your own personal use? 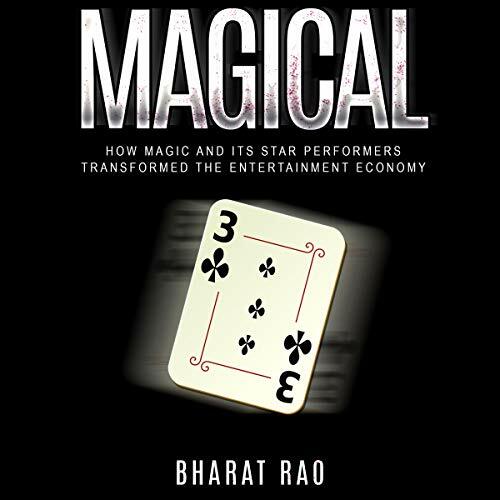 In this audiobook, you will learn of the key attitudes and practices that propel their success, as well as the path they have paved for other magicians and performers hoping to gain an entry into this competitive yet lucrative industry. We look at the magic industry through the lens of two of its most celebrated performers, Penn and Teller, who are not just magicians and entertainers, but also smart entrepreneurs running a global entertainment business. In parallel, we look at how the field of modern magic has evolved since its inception, what the outlook is for its future in our global, interconnected, always-on economy. We consider the successful careers of legendary magicians like Jean Eugène Robert-Houdin, Harry Houdini, Dai Vernon, Doug Henning, and others, and how they have shaped the growing magic industry and made it a force to be reckoned with. Through shows like Penn and Teller Fool Us, America's Got Talent, Britain's Got Talent, and The World's Best, and through social media outlets like Facebook, Twitter, Instagram and YouTube, contemporary magicians have an unprecedented opportunity to make themselves known to a global audience. The success secrets followed by the likes of Penn and Teller, David Copperfield, David Blaine, Criss Angel, and newer stars like Shin Lim, Dynamo, and Ryan Hayashi, both as professional magicians and business owners, can be applied by entrepreneurs, business people and self-starters everywhere who want to make a mark in their careers. Through constant efforts at design, experimentation, prototyping, and field testing with peers and live audiences, these performers have been fine tuning their craft for decades. With their passion, perseverance, commitment, and unique and creative ways of identifying and solving problems, these trailblazers show the way for a better - and more magical future. In this audiobook, you will not only learn how these stars successfully overcame their challenges, but also how you can transform your approach to magic and business. The trick of this book is how it connects magic to so many seemingly unrelated topics. From marketing to corporate innovation to entrepreneurship, Rao convincingly makes the case that there's a lot to learn from magicians. In particular, those who've had blockbuster success reinventing themselves and the age-old art of magic itself. This book gives some very strong insights into the modern magic landscape. Rao does an excellent job of explaining that the magic industry of today is bolder, classier, and higher-grossing than that of yesterday, all the while expertly blending insight with the scientific and cultural explanations behind the popularity of magic. I was very pleased to find interviews with Ryan Hayashi and other rising performers, which add a lot of depth and real-world commentary that Rao further builds on with hard facts. An all-around good read, and Joel Daffurn's narration is clear and understandable. Totally would recommend to anyone looking to get a new perspective on a timeless entertainment form.